We are pleased to offer UNC Graduate credit to our participating directors this year! This credit can also be used toward CDE Relicensure, and potentially toward lateral movement upon approval from your district. You must register for this $65, 1 credit course by February 9th. Please note that the process for registration takes at least two days, so you should begin the process before February 7th. 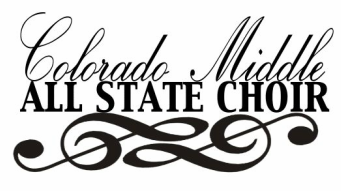 Students will successfully prepare their own student(s) for CMASC Festival participation and discern ways in which to apply observed conducting and rehearsal techniques from CMASC rehearsals into their own teaching. Students will also evaluate and reflect on the effectiveness of the conducting gestures of guest clinicians are rehearsal technique of these nationally recognized leaders and compare their effectiveness to the sound of the ensemble. Teacher musical preparation of their own students prior to the CMASC Festival. An All-State organizational/procedural meeting at the event. Journal entry related to student preparation and events observed during of All State Middle School Choir rehearsals.